The NET Bible is a completely new translation of the Bible, not a revision or an update of a previous English version. The New English Translation (NET Bible ® ) is a completely new translation of the Bible, not a revision or an update of a previous English version. It was completed by more than 25 biblical scholars – experts in the original biblical languages – who worked directly from the best currently available Hebrew, Aramaic, and Greek texts. Most of these scholars teach Old or New Testament exegesis in seminaries and graduate schools. Furthermore, the translator assigned to prepare the first draft of the translation and notes for each book of the Bible was chosen in every instance because of his or her extensive work in that particular book – not only involving teaching but writing and research as well, often extending over several decades. What is unique and distinctive about the NET Bible? Working with the format of electronic media, the NET Bible's translators, freed from the limitations of traditional print media, found an array of new ways to improve this translation in what can only be described as revolutionary. First, the NET Bible includes extensive notes with the translation, notes created by the original translators as they worked through the issues and options concerning the translation of the original language texts of the Bible. These notes operate on more than one level – a technical level for pastors, teachers, and students of Hebrew, Aramaic, and Greek who are interested in the grammatical, syntactical, and text-critical details of the translation, and a more popular level comparable to current study Bibles offering explanatory details of interest to lay Bible students. In electronic format the length of these notes, a considerable problem with conventional printed Bibles, is no longer a major limitation. Second, within the more technical notes the translation team has taken the opportunity to explain and give the rationale for the translation of a particular phrase or verse. Third, the translators and editors used the notes to show major interpretive options and/or textual options for difficult or disputed passages, so that the English reader knows at a glance what the alternatives are. Fourth, the translators and editors used the notes to give a translation that was formally equivalent, while placing a somewhat more functionally equivalent translation in the text itself to promote better readability and understandability. The longstanding tension between these two different approaches to Bible translation has thus been fundamentally solved. Fifth, the use of electronic media gives the translators and editors of the NET Bible the possibility of continually updating and improving the translation and notes. The translation itself will be updated in five-year increments, while the notes will undergo a continual process of expansion and refinement. Finally, the PC Study Bible version of the NET Bible contains all 60,932 of the translators' notes. The display allows you to simultaneously view the Bible text and footnote commentary in an accompanying pane. It's the easiest way for you to effortlessly move from passage-to-passage, access cross-referenced Scripture found in notes, and find all linked topical information. In short, the notes allow a running commentary on the translators' decisions to a degree never seen before in any translation of the Bible. 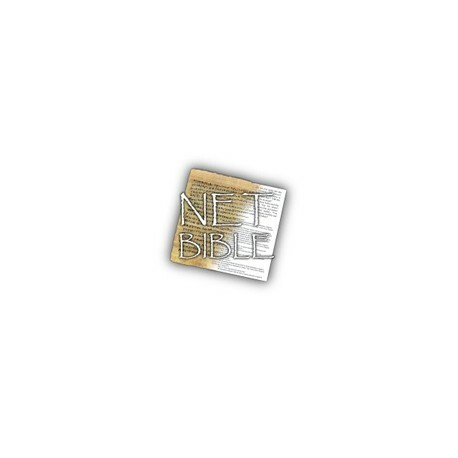 The NET Bible with the complete set of translators' notes is not just a very readable modern translation, but a copy of the Bible with its own commentary attached containing an average of two notes for each verse. Those who have years of expertise in the study of the original biblical languages can now communicate that information directly to the English-speaking Bible reader in a convenient, compact fashion that does not require the Bible student to read through a shelf of commentaries or spend years learning the original biblical languages.